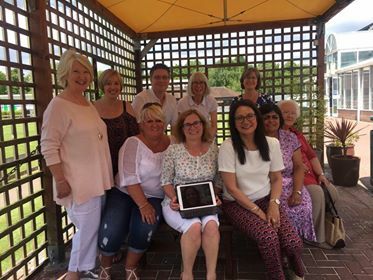 Staff from Personnel at Pebble Mill had a reunion in July 2017 – and here they are under the gazebo at the Tally Ho in Birmingham. Gilly Groom (was Sellars) first left. Going round the back row, next to Gilly Groom is Diane Verney, Stephen Davies. Lynda Perrin and Heather Jones. Front row is Jane Upston, Kate Hawkins, Rani Randhawa, ?, then Marie Phillips.